The Invacare® Tracer SX5® Recliner Wheelchair features an extra tall back and reclines up to 110 degrees making it an ideal choice for spending long periods in the wheelchair. 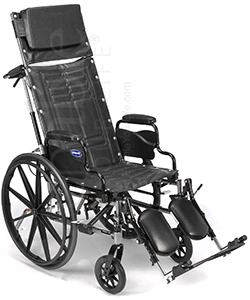 The Invacare® Tracer SX5® Recliner Wheelchair ships for free to the lower 48 States. If you are in Alaska or Hawaii, please contact us during business hours so we give you a price for shipping. Once the user is seated in the wheelchair, the back can be reclined by a caregiver, friend, or loved one. The process works by squeezing two release levers (one on each side) on the back of the wheelchair and lowering the back to the desired angle. To raise the back, the process is the reverse. Elevating legrests feature calf pads and can be elevated roughly so that the legrest itself is parallel to the ground. Desk length armrests allow the user to roll up closer to a table or desk. Useful for eating, working, or other activities. They are removable for easier transfers to and from the wheelchair. Anti tippers - This safety item fits on the rear of the wheelchair and keeps the wheelchair from tilting backwards. Seat width is 16" or 18"
Seat to floor height is 19.5"